Too busy to juice? No time to juice? Don’t like to cut fruits or wash a juicer? Now … there is NO excuse not to juice, with Kuvings Wide Mouth Slow Juicer (a.k.a. Kuvings Whole Slow Juicer). Kuvings = Kuche (Kitchen) + Well being, Living. Some of the reasons why many people are still not juicing are simply that they don’t have the time to juice, don’t like to cut the fruits or wash up a juicer. Yes, I hear that A LOT! Kuvings understood this and have designed juicers that make juicing as convenient as possible for consumers. This time, they have gone a step further to produce a WIDE MOUTH juicer that will simply save so much preparation time, and a slow juicer at that! It is a wow … like a juicaholic’s dream come true! 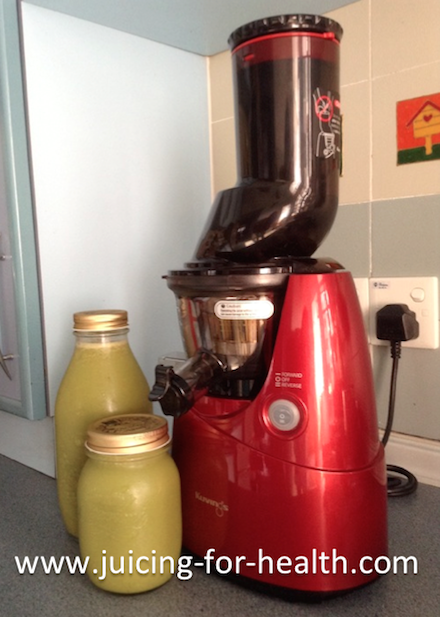 I am privileged to be one of the very first few to get a hold of a brand new Kuvings Wide Mouth Slow Juicer. The FIRST of its kind in the world (October 2013). Having gotten acquainted with Kuvings’ other vertical slow juicers (previous models), and impressed with their performance, I was excited to actually own this new beauty! Confession: For some time now I had somewhat “lost interest” with the many vertical juicers that flood the juicing market. Many are sold very cheaply and are of inferior quality which I would personally not like to own. This juicer review on Kuvings Whole Slow Juicer is my opinion from using/investigating many different slow juicers in the market, both horizontal and vertical. There is a LOT to say about this juicer, the manufacturer thought of everything! But, for the sake of a concise review, I will mention only what is necessary for you to make your own decision whether this juicer is suitable for you. Kuvings Whole Slow Juicer is a juicer designed and manufactured in Korea. The company in Korea is renowned as the leader in designing small kitchen appliances for health-conscious consumers. They are award winners and known to take the lead in the industry as trend-setters. With this new wide mouth juicer, they are setting a new trend … look out for coming imitation models by competition! 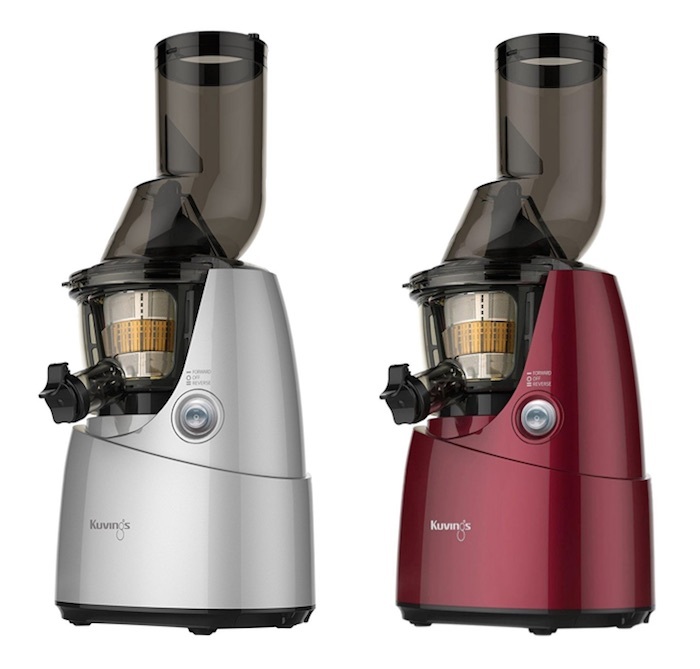 Kuvings Whole Slow Juicer comes in two colors—silver and wine red. It has a 3-inch wide mouth with red lips, and a tongue! A tongue? Yes, it is what the manufacturer calls the “rib” but it looks like a tongue that is built into the wide opening. This “tongue/rib” is a safety requirement by Korean authorities, and is a safety feature by the manufacturer, to prevent wandering hands from reaching the crushing gear. The knife is sharp enough to cut any fruits with a gentle force using the pusher, yet it is not sharp so as to cut your hand. This tongue stops whole fruits from entering the chute all the way. A gentle push using the provided food pusher easily cuts the fruits into two that eases up the crushing and masticating work. The food pusher also acts as a lid for the wide mouth juicer, to prevent pests getting in when not in use. The Kuvings Whole Slow Juicer came in an elegant black box weighing about 18 pounds (~8.15 kg). The juicer itself weighs about 14 lbs (~6.4 kg). There is a quick-start guide if you want to dive straight into juicing without reading the manual. The manual covers all you need to know about the juicer, including topics such as ingredient preparation. I found it to be rather helpful. * Technical specifications are at the end of this page. Before I discuss what’s new, I’m happy to say that I’m comfortable and happy with the solid feel of the Kuvings juicers. I love the smooth, quality built of this juicer. One of the new features I like about Kuvings’ vertical slow juicers, is the detachable smart cap. The smart cap is a lid-like attachment to the juice spout. It allows you to keep the spout closed, to allow mixing of juices in the juicing drum before you drain it into the juice collecting jug. It is also used when making smoothies or ice-cream. With the smart cap, juice can also be released directly into a glass. This reduces spills, drips and juice loss during transfer. Very smart indeed! Another innovative design with Kuvings juicers is the external rotating brush that makes washing up so easy. Just fit and twist. More about washing below. The Kuvings Whole Slow Juicer comes with optional smoothie and ice-cream strainers. When testing out the Kuvings Whole Slow Juicer I tried juicing various fruits and vegetables to determine how the wide mouth “gobbles” them up, the juice quality, and the pulp. Juicing Romaine lettuce and broccoli. I was asked to compare juice yield with other juicers. I won’t be doing that because there are too many juicers to compare with. From past experience, the difference in juice yield is almost negligible. What I do look at though, is whether the produce gets masticated properly, the juice quality, and how dry the pulp is. 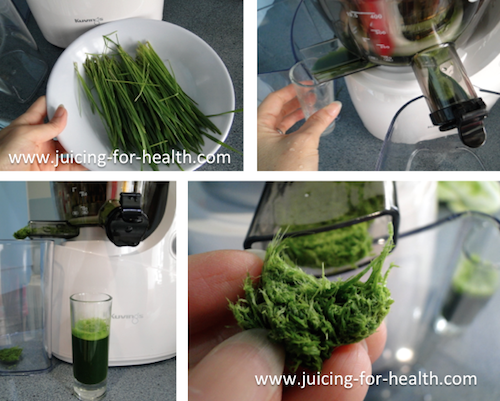 One of the biggest tests with a vertical slow juicer is whether it can juice wheatgrass. With so many vertical juicers in the market, especially the lower end ones, juicing wheatgrass on its own is almost impossible. The Kuvings Whole Slow Juicer passed the test with flying colors with a rather impressive juice yield! Surprisingly, the taste was not as “grassy” as I thought it would be. I bought a packet of cut wheatgrass which weighs about 30 grams that was supposed to yield two shots (2 oz) if using a twin-gear juicer. Initially, there was a little juice flowing out of the pulp spout as the pulp was too little to be expelled yet. No problem, I collected it into my 3-oz shot glass. (See image). I was happy to have the smart cap holding the juice output. If the juice was collected in the jug and then poured into my shot glass, there would be some loss during the transfer. With the smart cap, I get to collect every drop of the precious juice. As you can see in the picture, the juice yield was rather good. Not exactly 2 oz there, but close. And the pulp was dry. I’m just happy that this juicer could even juice wheatgrass! The Kuvings Whole Slow Juicer produces pretty good, rich, quality juices, considering that it is a vertical gear juicer, comparable with its closest competition, JuicePresso. There is a compression silicon rubber at the bottom of the juicing bowl that gives the pulp a second press in order to squeeze it dryer. 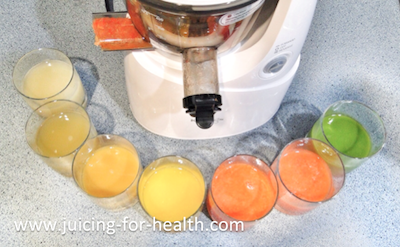 As I was testing, I juiced only one type of fruit or vegetable each time. I found that juicing fibrous produce continuously, like vegetables (especially celery) may require regular clearing of fiber from the pulp output channel. This is a common issue with vertical gear juicers. One way of managing fiber is to cut long vegetables into shorter 6-inch pieces. Another way is to alternate feed with other fruits and vegetables. Juicing effort was smooth when I fed mixed fruits and vegetables alternately. Although this wide mouth is built to take in whole fruits without cutting, some harder fruits/vegetables still require to be cut, in order to get past the “tongue” and also to reduce putting strain on the gear at the initial crush. Lotusroot is one example where it needs to be cut before feeding. Although the Kuvings Whole Slow Juicer came to me as a test unit, I would also like to keep this beauty in good working condition for as long as possible. A little understanding of the juicer, care and patience in operating this juicer will ensure an enjoyable long-term partnership. Once I understood how this juicer works, what it does well or doesn’t, I work with its strengths and find that it makes juicing a pleasure. The manual that came in the box says to soak hard vegetables like carrots before juicing. I don’t soak the carrots, just washed and cut into two, lengthwise. You don’t have to do so with thin carrots but with those really fat imported carrots, I am not taking any chances, although I’m sure this juicer strong enough to handle them. Like most vertical gear juicers, there are five steps to assembling the Kuvings Whole Slow Juicer. The manual comes with step-by-step assembly instructions. The parts all fit very easily and don’t sound “clunky” as with some other vertical juicers. Kuvings is innovative with its design and really makes an effort to make juicing convenient. The juicer has a silicone wiper which is attached over the strainer to clean the wall of the juicing bowl while in operation. It makes washing up later, easy. While juicing, you may clean the juicer between different ingredients to wash off the color, taste and smell of prior juice. Do this by closing the smart cap, pour water into the juicer through the chute and let the juicer run for a few seconds. Turn it off, and open the cap to allow the water to flow out into the jug. By the way, the juicing bowl is made of solid non-toxic, food-grade, BPA free material that is completely safe for daily use. Even after juicing foods with strong odor like garlic, it does not leave the smell behind after a rinse. For easy cleaning of the strainer, there is an external rotating brush included in the box that comes in a bright green color. It works by attaching it over the strainer and twisting it a few times under running water. However, I find it easier to just use the provided cleaning brush that looks like a giant tooth-brush as I can apply the necessary pressure where it’s needed to remove pulp residue stuck among the strainer holes. Tip: Try not to end your juicing with fibrous soft fruits, like oranges, as they’re a little harder to brush off. Washing up is a breeze once you get accustomed to it. I don’t foresee any major problem here. This wide mouth juicer is designed for convenience and to save time on preparation work. However, along with convenience, always ensure safe operating procedures. Even with the “tongue” in place, my slim hands could reach all the way into the crushing area. 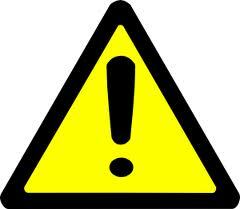 DO NOT reach into the chute to try to push a piece of fruit, while the juicer is running! Always use the food pusher, or stop operation before reaching into the chute with your hand. DO NOT allow a child to operate the juicer without adult supervision. DO NOT refeed the extracted pulp into the juicer. This may cause the juicer to jam. 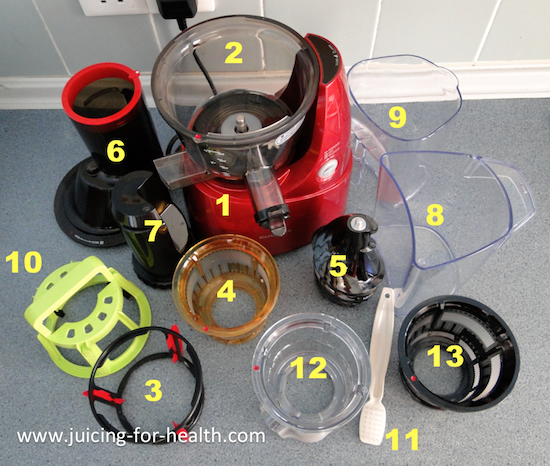 DO NOT put dried or hard ingredients into the juicer when using the juicing strainer. For example, whole grains, hard seeds or ice cubes. The Kuvings Whole Slow Juicer is a solid beauty, improved model, and built with consumers’ convenience in mind, yet not compromising on juice quality. The wide mouth is a major advantage and makes juicing so much easier for anybody. However, one has to get to know and understand this juicer in order to gain maximum benefit from it. After spending just a few hours with it, I was happy to know it more intimately and began to appreciate how this juicer is a class of its own. It is a wide mouth juicer (3-inch diameter), saves so much preparation time! It is quiet, only a low whirring sound (except with some squeaking when juicing vegetables where there is friction). 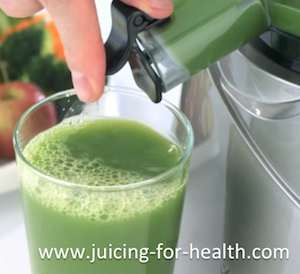 It is a slow juicer (running at 60 RPM) that preserves enzymes and nutrients. It can juice wheatgrass and vegetables. Juices may be a little pulpy (fine pulp) that can be strained, but I like mine rich as it is. The smart cap—really like this one! It has volume measurement markings on the juicing bowl. Great for knowing how much juice I make each time. It has optional strainers for making smoothies and ice-cream. It is easy to wash up, just rinse under running water. No difficult-to-reach corners. Excellent warranty coverage, with option to upgrade to Extended Warranty (see below). It is tall. Feeding the produce into the chute is not a problem. But, it is a problem when the food pusher is required. I got around this by cutting some of the fruits and vegetables to ease up feeding work without having to use the food pusher. Placing the juicer on a lower counter might help for some. The parts may be a little bulky for storage. Admittedly, the Kuvings Whole Slow Juicer is a high-end slow juicer, and a little pricey. However, considering the innovative design, quality construction, time-saving features and the warranty coverage, I personally think that the price tag is about right. Just the warranty coverage alone makes the juicer worthwhile. Trust me with this. I’ve seen another competing juicer whose strainer breaks frequently! We want juicing without hardware problems by making the right investment! Opt for the Extended Warranty to protect your investment. Moreover, the extended warranty increases your juicer resale value should you ever want to sell it later. Free Strainers: For making smoothies, ice-cream, mincing and grinding. Warranty: 10 years warranty on motor, screen and gear, 1 year on other parts. 20 years on motor, screen and gear, 5 years on other parts.